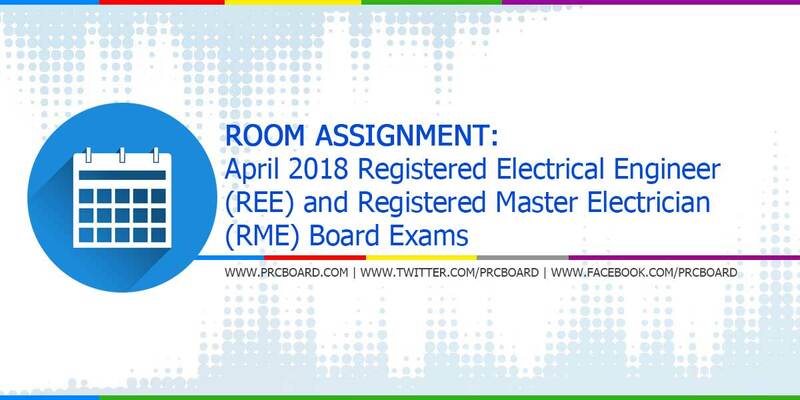 MANILA, Philippines - The Professional Regulation Commission (PRC) Board of Electrical Engineering released the April 2018 Registered Electrical Engineer (REE) and Registered Master Electrician (RME) room assignments few days before the licensure exams. The Electrical Engineering board exams are scheduled to take place on April 17-19, 2018 at PRC testing centers in Manila, Baguio, Cagayan de Oro, Cebu, Davao, Iloilo, Legazpi, Lucena and Tacloban. Electrical Engineering is one of the programs with average number of examinees being administered by PRC. On the most recent exams conducted on September 2017, 2,807 out of 4,460 examinees passed the REE while 2,643 out of 3,864 passed the RME. On April 2017, 994 out of 2,213 REE examinees and 1,817 out of 3,130 RME examinees successfully passed. To receive regular updates about April 2018 Electrical Engineer (EE) board exams results as well as other related announcements, you may refer to our social media pages via Facebook and Twitter. when are you going to update room assignment here in Cebu? when are you going to update REE, RME room assignment in Cebu? plz update room assignment for cebu takers. asap! tomorrow. na exam bakit wa pa update? Asa nmn room assignment para cebu? Atay oe. Exam nata ugma. Pakulba2 sd mo dah. Atay oe.